If you want a sunscreen that doesn’t sting your eyes, is free from harmful ingredients and helps prevent skin cancer – read this guide. What’s the best sunscreen for surfers? 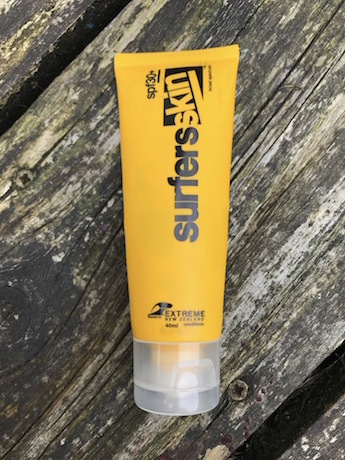 The best type of sunscreen for surfers is very water resistant, gives UVA and UVB protection, and ideally contains non-nano zinc oxide and/or titanium dioxide. If you don’t have the time to read this guide, this advice will help you choose a good sunscreen for surfing. If you want to be better informed, read on. Does sunscreen prevent skin cancer? Seems like a silly question, but reputable media sources e.g. The Guardian have asked the same question, and the answers are by no means conclusive. A study published in Nature (a science journal) stated that sunscreen ‘only provided partial protection’. To save you reading all the techy science jargon, the summary is: yes, sunscreen can help prevent skin cancer. But avoiding sun exposure is better, and if you do need to go out in the sun cover up and wear sunglasses. SPF stands for Sun Protection Factor and is the big number on your sunscreen bottle. It’s an indication of the level of protection against the sun’s effects. Roughly speaking, if you have a SPF15 cream, it will give you 15 times the protection of having no cream. So if you burn after ten minutes in the sun with no protection, SPF15 theoretically gives you 2.5 hours protection before you burn. It’s not as simple as that unfortunately, as many other factors besides the SPF have an affect. For example, swimming, sweating, any abrasion from clothes or a towel will all reduce the amount of protection, as they remove some of the sunscreen. How well you apply the sunscreen in the first place also affects the effectiveness. You should choose a sunscreen with between SPF15 and SPF50. Any lower than SPF15 you won’t be getting effective protection, any higher than 50 offers very little in terms of extra protection. For example, SPF50+ filters out 98% of UVB radiation compared to 96.7% blocked by SPF30+, according to Cancer Council Australia. In short, you want a sunscreen that will protect you from both UVB and UVA. SPF is primarily concerned with blocking UVB. UV stands for Ultra Violet, and refers to the light radiation emitted by the sun. UV sun radiation is transmitted in three wavelengths – UVA, UVB and UVC. We only need to protect ourselves from UVA and UVB, as UVC can not penetrate the earth’s atmosphere. UVB causes sunburn and increases the risk of skin cancer. UVA has long been known to cause ageing of the skin, but it’s only recently been discovered as a contributing cause of skin cancer. Some sunscreens indicate the level of UVA protection using stars, with 5 star being good and 1 star bad. However, 5 star UVA protection on a low SPF cream will not offer good all round sun protection. What you need to look for is a ‘broad spectrum’ cream with a high SPF and lots of stars. Ideally SPF30-50 with 4 or 5 stars. Vitamin D helps the body absorb calcium, and calcium is required to keep bones, teeth and muscles healthy. A lack of Vitamin D can cause soft bones in children (rickets) and misshapen bones in adults (osteomalacia). The problem is the best source of vitamin D is from the sun’s UV radiation, which is also a major cause of skin cancer. So a sensible balanced approach is required. In most parts of the world, you can get the required daily dose of vitamin D by spending a little time outdoors. If you spend a lot of time outside or there’s a risk of sunburn, then sun protection is advised. Cream can be a bit messy and difficult to evenly apply, but virtually every site I researched say ‘do not use spray’. I personally find sprays quick and easy to apply, but that’s half the problem. Because the spray is so fine and easily absorbed, it’s difficult to see where the sun spray has covered and more importantly not covered. So missed bits get burned, and it’s easy to apply too little. The other half of the issue is spray can easily get inhaled. The chemicals and minerals in sun cream can be harmful when applied to skin (more on that in a bit), but swallowing them should definitely be avoided. If you want to use sprays, then spray onto your hands first and away from the face. Creams are still the best option when applied liberally and evenly. They might take a little longer to apply and soak in, but they are likely to last longer and offer better protection. I like natural stuff as much as the next person, but when it comes to preventing skin cancer I get increasingly skeptical. So does the natural sunscreen work as good as the chemical stuff? Chemical sunscreens are usually easy and smooth to apply, plus they’re often invisible once soaked in. Mineral sunscreens are often thicker and can leave the skin looking pale. This is because chemical sunscreens work differently from mineral sunscreens. Chemical sunscreens soak into the skin and allow UV radiation to be absorbed. This means UV radiation reaches deeper into your skin, potentially causing damage. Mineral sunscreens containing zinc oxide and/or titanium oxide create a barrier upon the surface of your skin and reflect UV radiation. This helps prevent UV radiation penetrating your skin and causing damage. Mineral sunscreen also works immediately and is usually suitable for sensitive skin (zinc oxide is used in nappy cream). Chemical sunscreen needs time to soak into your skin (usually 15 minutes) before it’s effective and can irritate sensitive skin. 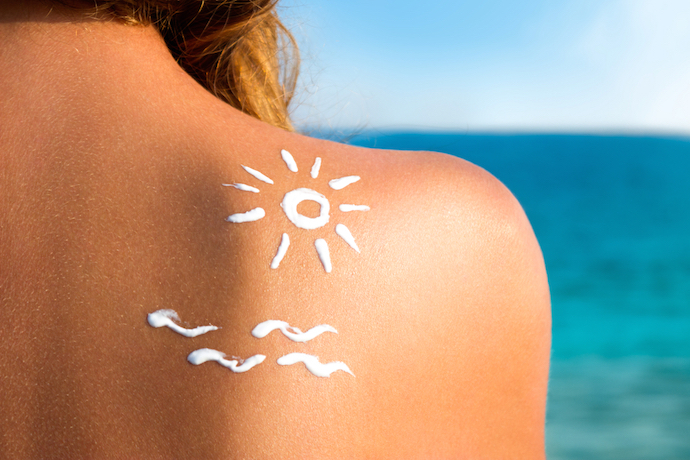 Some ingredients in chemical sunscreen have even been reported as causing disturbances in hormones and sperm! Oxybenzone is a common sunscreen ingredient and is placed at the top of the Environmental Working Groups (EWG) toxicity table. It acts like estrogen, alters sperm production in animals and is associated with endometriosis in women. It’s also likely to cause an allergic skin reaction if you’re prone to such things. Octinoxate and homosalate are also widespread in chemical sunscreens, potentially causing similar issues. You can add octocrylene to your list as well. Having said all that, all of these chemicals are found in mother’s milk and only limited studies have been conducted. So the level of risk is debatable. Parabens including methylparaben, propylparaben, butylparaben, and ethylparaben are commonly used in sunscreens and cosmetics as a preservative. Parabens have been associated with breast cancer, hormone development and premature skin aging. However, official sources including the FDA and NHS say there’s no proof that parabens are harmful but further research is required. Other ingredients to look out for particularly if you have sensitive skin are petroleum, silicones and synthetic fragrances. Used to make the cream feel smooth and smell nice but can cause skin irritation. Using chemical sunscreen is better than getting burnt, but mineral sunscreens without these chemical ingredients is the logical choice for me. Look for mineral sunscreens containing zinc oxide and/or titanium oxide. They don’t penetrate the skin and reflect UV rays, so they’re potentially safer (unless you eat them). However, to avoid the ghostly shade created by the layer of minerals some sunscreens use nanoparticles. The nanoparticles mean you avoid looking like Caspar the friendly ghost, but there are concerns the particles might be absorbed by the skin. Current research indicates these fears are unwarranted. Read the ingredients before you buy your next sunscreen, and remember not all mineral sunscreens are free from chemicals. Whatever sunscreen you prefer, you must put it on evenly and liberally over all exposed areas. If you apply sunscreen in a rush or half-heartedly, you’re bound to miss bits. If you need help reaching awkward areas, ask someone to help. Being bashful will get you burnt! You should also apply sunscreen 15 minutes before going in the sea. The 15 minutes thing is important. Some sunscreens soak in quicker and better than others. Mineral sunscreens work immediately. But if you put on sunscreen just as you’re about to enter the water it’ll wash straight into your eyes and sting like hell. So if there’s a chance of sunshine and you’re planning a surf, put on sunscreen before you grab your board and go. That way the sunscreen will soak in on your way to the beach and you’re less likely to sore eyes. I’ve recently tried and tested a range of sunscreens to see how they fair when surfing. All are labelled as very or extra water-resistant, and offer some degree of UVA protection. This is not a scientific study, just my honest opinion. Sett Surf products are natural, preservative free and tested on surfers. This tube contains zinc for sun protection, rosehip for moisturising and green tea to nourish your skin. For the full sun care set try the lip balm and face stick too. For a zinc based cream it rubs in well with only a faint white afterglow, but the face stick feels smoother on application. It smells pleasantly medicinal, doesn’t sting the eyes and stopped my bald head getting burnt when testing on a sunny surf session. Summary: natural, choice of sun care options, surfer-friendly. 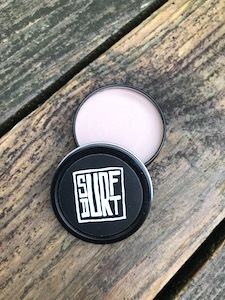 Few people think about the effect of suncream slicks on our precious reefs and oceans, but the clever creators of SurfDurt did. It’s reef-safe, all-natural, organic and produced using solar power. It’s also solid like lip gloss, so splurt-free. It smells like coconuts and cookies, applies smoothly, soaks in quickly and doesn’t sting your eyes in water. If you want an environmentally friendly sunscreen for surfing, SurfDurt is hard to beat. This is a new product developed specifically for riders of the mountains, roads and sea. Due to the candelilla wax it does feel a bit like gloss paint on application, but it soaks in surprisingly well and the wax makes it super water resistant. Worked great in the sea and passed the stingy eye test. Smells pleasantly medicinal with a hint of coconut. I interviewed the creator Tom Marshall when they launched their skincare range, and he had some interesting stuff to say. Read the interview and learn more here. Summary: Great ingredients and works a treat in the surf. I’ve used this for a while as it’s smooth and easy to apply, it smells nice and it works. If you let it soak in for 15 minutes, it’s good in the water. If you don’t it’ll get in the eyes and sting a little. 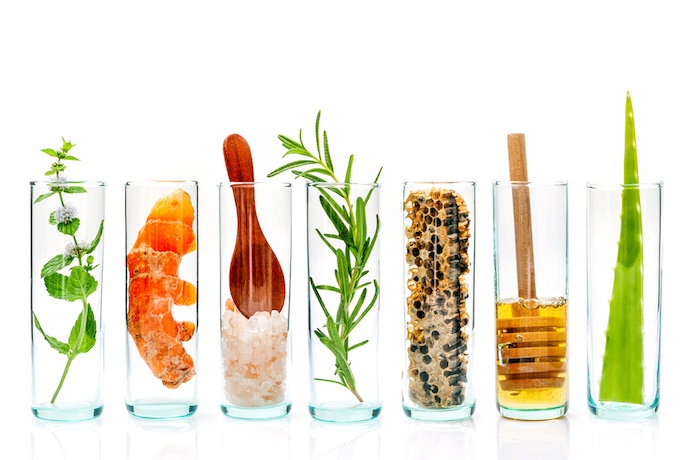 With just about every sun protecting ingredient available, it does offer good sun protection. It also contains aloe vera and manuka honey, offering moisturising and antibacterial benefits. But it does contain chemicals at the top of the toxicity table. Summary: sweet smelling, moisturising and does the job. Perfect for purists as this cream claims to be 100% certified natural with 98% organic ingredients. The ingredients list is refreshingly simple as it contains only zinc oxide (22.5%), sunflower seed oil, beeswax, jojoba seed oil and sunflower vitamin E.
Perhaps unsurprisingly this is a thick white cream, but it rubs in ok and doesn’t leave you looking like a ghost. I’ve only had a chance to try this once, but it worked fine in the water and passed the stingy eye test. Summary: unscented, simple, effective sunscreen in and out of the water. 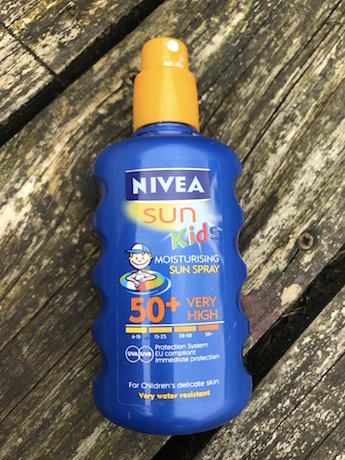 Nivea is an old family favourite and their high factor kids range offer high levels of sun protection and extra water resistance. This one is coloured green, so it’s easy to see bits you’ve missed when applying. It’s half the price of the others reviewed so far and you can buy it just about anywhere. However, I nearly always get a bit in the eyes when surfing and it’s complicated list of ingredients raises suspicion. It contains octocrylene which is low on the toxicity table, but it also contains parabens. Summary: cheap, easy to apply and effective out of the water. 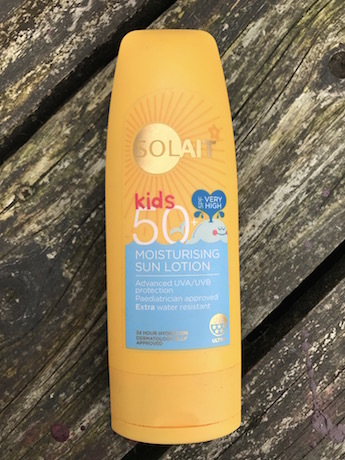 Superdrug’s own brand sunscreen is the only completely chemical sunscreen I’ve tested and it’s the cheapest. 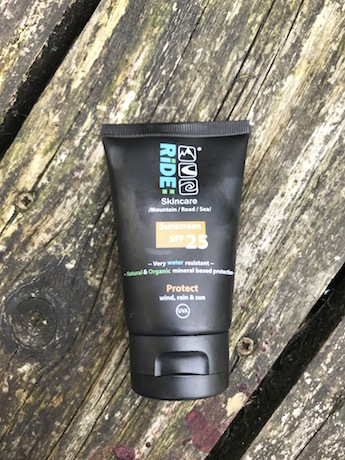 I bought it because the label ticks all the boxes: high spf, extra water resistant, 5 star UVA protection. But like the Nivea sunscreen it contains a lot of mystifying ingredients with very long names e.g. Butyl Methoxydibenzoylmethane. With such a complicated cocktail of chemicals it’s a struggle to believe octocrylene is the only dubious ingredient. That said, it smells nice, it protected me from getting burnt, it’s really smooth and easy to apply. It didn’t pass the stingy eye test whilst surfing, but if you’re not worried about chemicals it’s good for land lovers. Summary: smells nice, silky smooth and offers good value UV protection. In my tests sunscreens containing mineral ingredients and designed for watersports performed best in the water. The cheaper more chemically creams nearly always failed the stingy eye test. 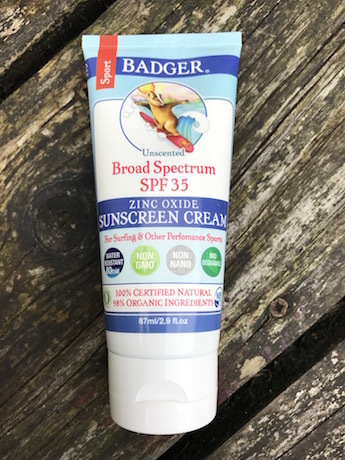 I personally keep a small tube of Badger in my car’s glove compartment and Surf Durt in my wetsuit bag to use before surfing. But I’m still hunting for a cheaper, smoother, mineral cream for holidays, when I need to cream up from head to toe on a daily basis. Any recommendations gratefully received. Thank you for the insightful info on sunscreen guide for surfers. Although I don’t want to jump into details, I enjoy the read and like becoming informed. Five minutes reading this is better than spending years dealing with Skin Cancer or lifelong deficiency of Vitamin D. However, I do hope that readers will get to the point where we are “told” which brands are good…I trust you guys, so can you not list the top 10? Or do a matrix of features? What do the pros use? What do you guys use? I’m happy to share any other surfer’s recommendations, just leave a comment. I currently use the Ride and Badger products for surfing as they’re the most water resistant and mineral based. I’ll also be asking around and will try and update the post soon. I like the idea of a quick and easy table for comparison. Wow – a bunch of research has gone into this, thanks! It’s good to get past all the marketing and actually pin down the truth. 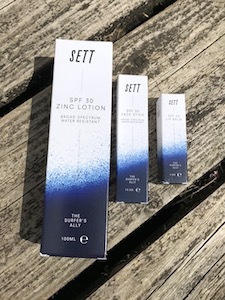 When I was young, my mum would always say that the SPF number was how regularly we needed to apply sunscreen again (in minutes)! We always overran the time (too much fun being had on the beach) but ultimately we’d remember and would reapply in a good time based on my mum’s secret knowledge of what SPF actually meant! I like the 5 S rule as well – will remember that for the future – still relevant even in cloudy Britain! Mother’s always know best! Glad you liked the post and thanks for taking the time to comment. Good luck with the new Boardwalk Clothing website. After reading your blog ages ok, I relooked at this as was fed up getting stingy eyes, could find any of your top recommends locally, but after looking at whats on offer i found this one. Island Tribe ( Annes Cottage) its a clear gel and works brilliantly, i spent 5 hours surfing yesterday and only had to apply the once. They offer 2 sizes, i spent £18 on the larger 100ml, defo worth it! I like the idea of a clear gel, will definitely give that a try. Thanks for the tip off. I’ve been testing all the creams I’ve listed and my current favourite is the Surf Durt. Because it’s light brown and more of a paste than a cream. So it doesn’t run into my eyes or make a mess and it actually gives me a more tanned appearance. Unlike a lot of creams that wash into my eyes when surfing, splurt everywhere and make me look pale. It also smells nice.